Motion Control - Metric Sintered Bronze, Bronze Alloy, Iron "Self Lubricating" Bearings! 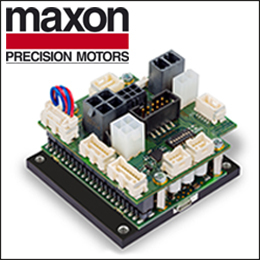 E. Longmeadow, MA Motion — Control Components – Linear Motion – Available off-the-shelf, cylindrical, self lubricating, sintered bronze bearings from LM76 feature: Very high precision (e.g +2μ to +12μ for 2mm ID bearings), high load capacity (100kg/sq cm), high speed 30,000 rpm) and rapid oscillation capabilities, low/high temperature (-60OC to +230OC), very low coefficient of friction (0.02), and low noise. These reliable, economic bearings are available in metric sizes (2 mm to 100 mm ID by 2 mm to 120 mm long) and have applications in: Appliances such as washing machines, exercise equipment, portable machine tools, toys, motors, packaging machinery, garden tools and machinery, vibration damping, and automotive equipment such as alternators. These lifetime Self Lubricating bearings are impregnated in the sintering process with a lubricant to suit the application. Sintered bearings are available in lead free Bronze, bronze alloys and Iron. Additionally: Flanged bearings (IDs 3 mm to 60 mm by 4 mm to 60 mm long) and precision (ID tolerance ISO H7) Spherical bearings, with or without a collar, (IDs 4 mm to 12 mm by 10 mm to 23 mm ODs) are available, as well as custom sizes and designs. Because of the very low coefficient of friction these bearings show no wear after many thousands of hours of use. Standard metric cylindrical and flanged oil impregnated bearings are typically shipped from stock, Custom bearings (ID, OD, flange size, and length) can be ordered as well as special purpose alloys. 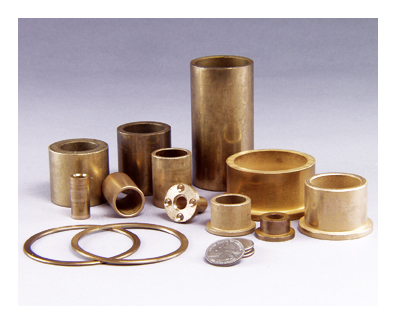 Alloys include: sintered bronze, iron sintered bronze, ParaliteTM (non-migrating lubricant), and TriboloyTM (chromium, nickel, cobalt alloy for temperatures over 1000O F). TriboloyTM sintered bearings are resistant to corrosion, erosion, abrasion, and galling, and even at high temperatures they are resistant to oxidation.